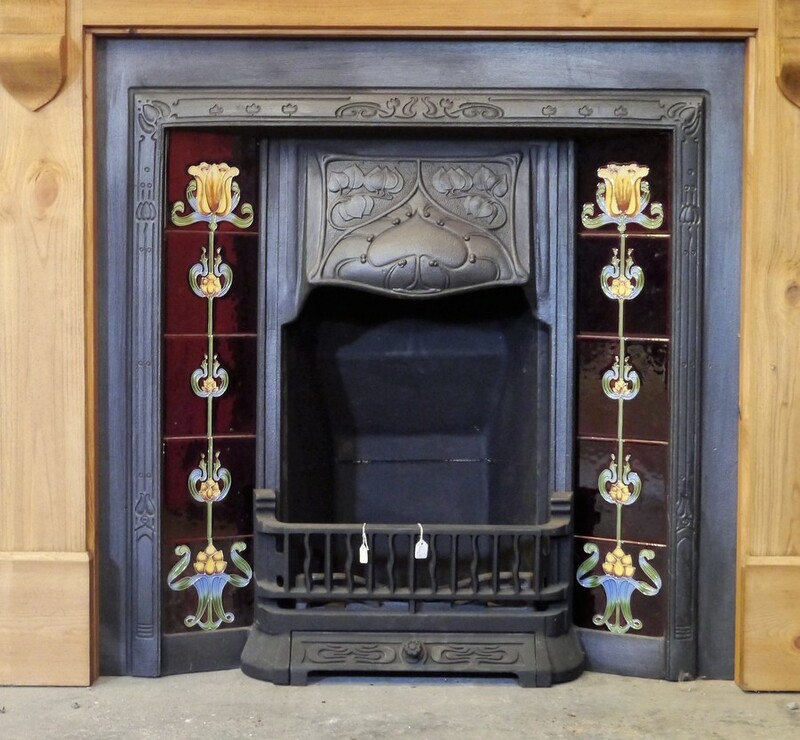 BSTI-001 Cast iron tiled insert fully restored and ready to go as a working fireplace. Pictured with a set of reproduction fireplace tiles, sold separately. The tiles can be changed with others from our collection, we have over 150 sets of reclaimed fireplace tiles to choose from. This fireplace can also be supplied without tiles should you wish to provide your own. LSAI-002 Reproduction cast iron arched insert. 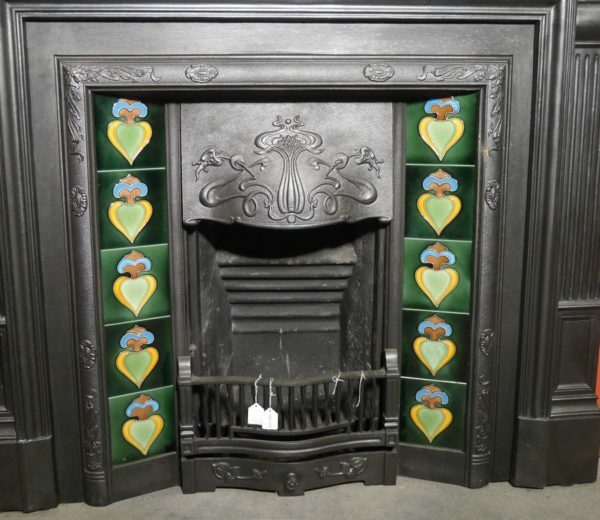 Reproduction Art Nouveau style cast iron tiled insert. Tiles can be changed from a choice of our stock tiles. LSTI-006 Reproduction Art Nouveau style cast iron tiled insert. Tiles can be changed from a choice of our stock tiles. 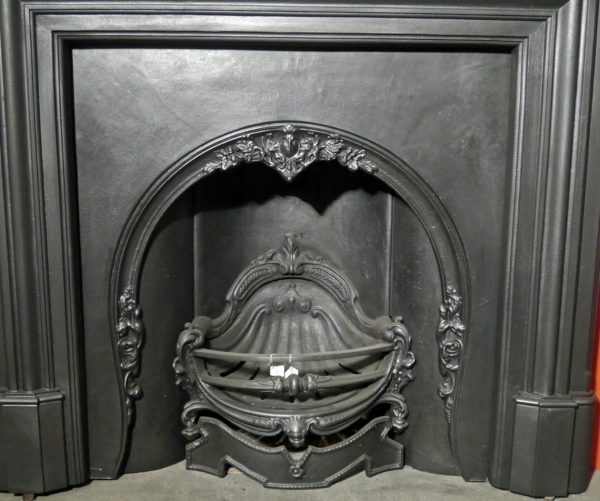 LSCI-001 Original regency cast iron insert. 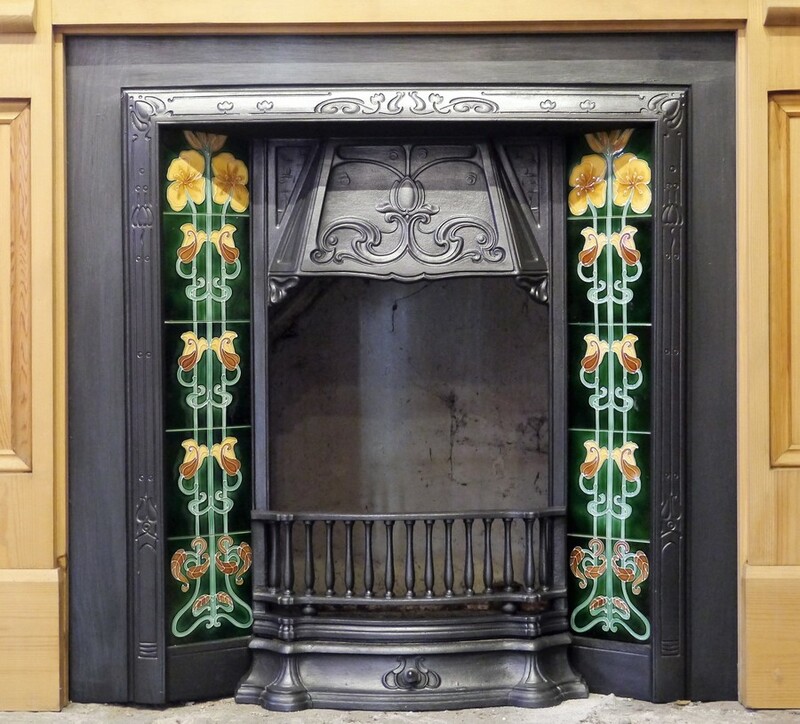 LSTI-001 Cast iron tiled insert fully restored and ready to go as a working fireplace. Pictured with a set of reproduction fireplace tiles, sold separately. The tiles can be changed with others from our collection, we have over 150 sets of reclaimed fireplace tiles to choose from. This fireplace can also be supplied without tiles should you wish to provide your own. 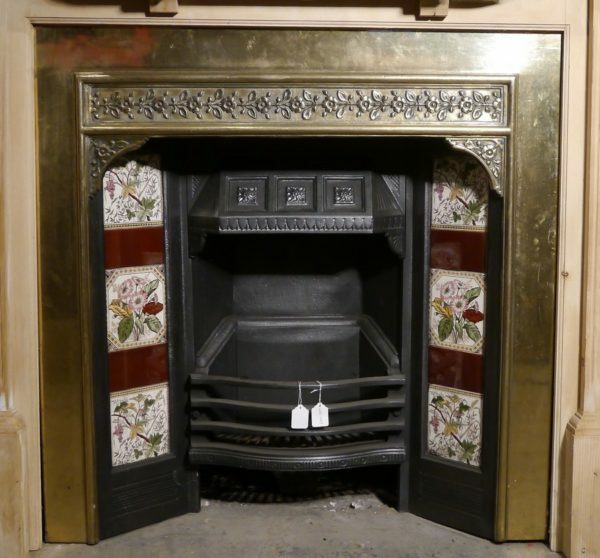 LSTI-002 Cast iron tiled insert with brass outer edge fully restored and ready to go as a working fireplace. Pictured with a set of original fireplace tiles, sold separately. The tiles can be changed with others from our collection, we have over 150 sets of reclaimed fireplace tiles to choose from. This fireplace can also be supplied without tiles should you wish to provide your own. 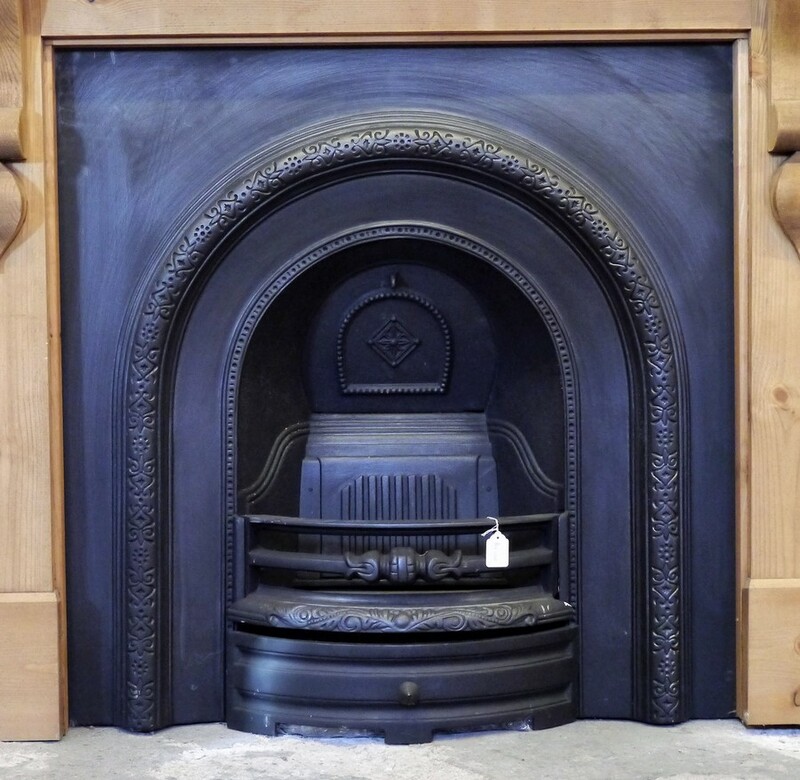 LSAI-001 Cast iron reproduction arched insert fully restored and ready to go as a working fireplace. 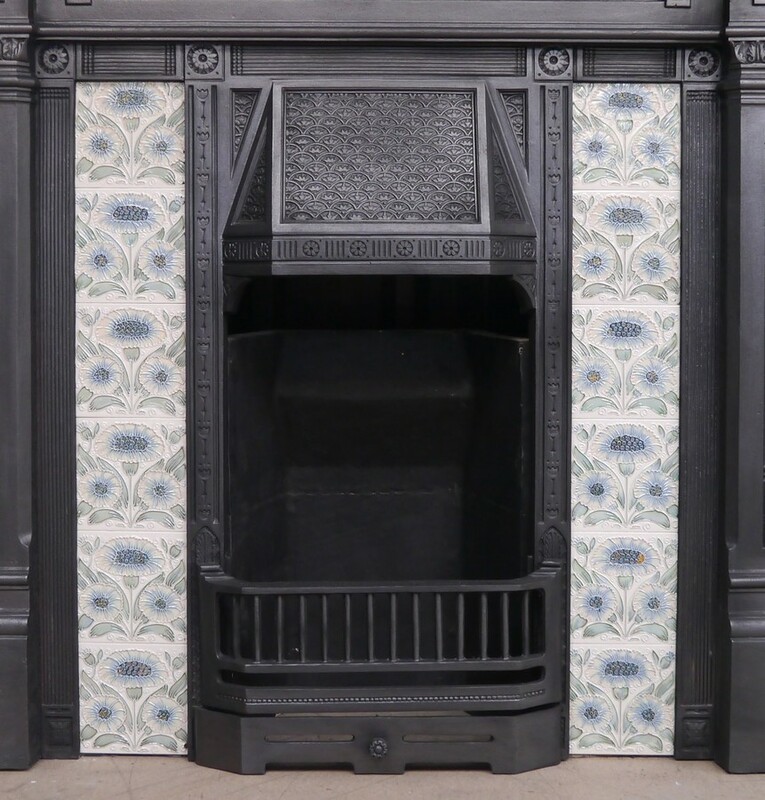 LSTI-003 Cast iron tiled insert fully restored and ready to go as a working fireplace. Pictured with a set of reproduction fireplace tiles, sold separately. The tiles can be changed with others from our collection, we have over 150 sets of reclaimed fireplace tiles to choose from. This fireplace can also be supplied without tiles should you wish to provide your own. LSTI-007 Reproduction Art Nouveau style cast iron tiled insert. Tiles can be changed from a choice of our stock tiles. 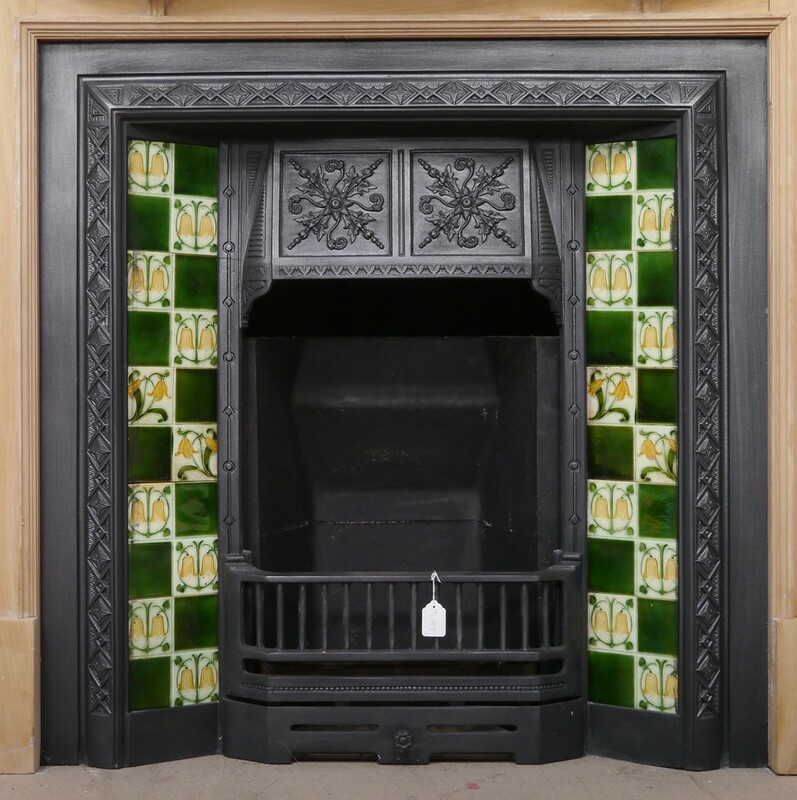 BSTI-002 Cast iron tiled insert fully restored and ready to go as a working fireplace. Pictured with a set of original fireplace tiles, sold separately. The tiles can be changed with others from our collection, we have over 150 sets of reclaimed fireplace tiles to choose from. This fireplace can also be supplied without tiles should you wish to provide your own. 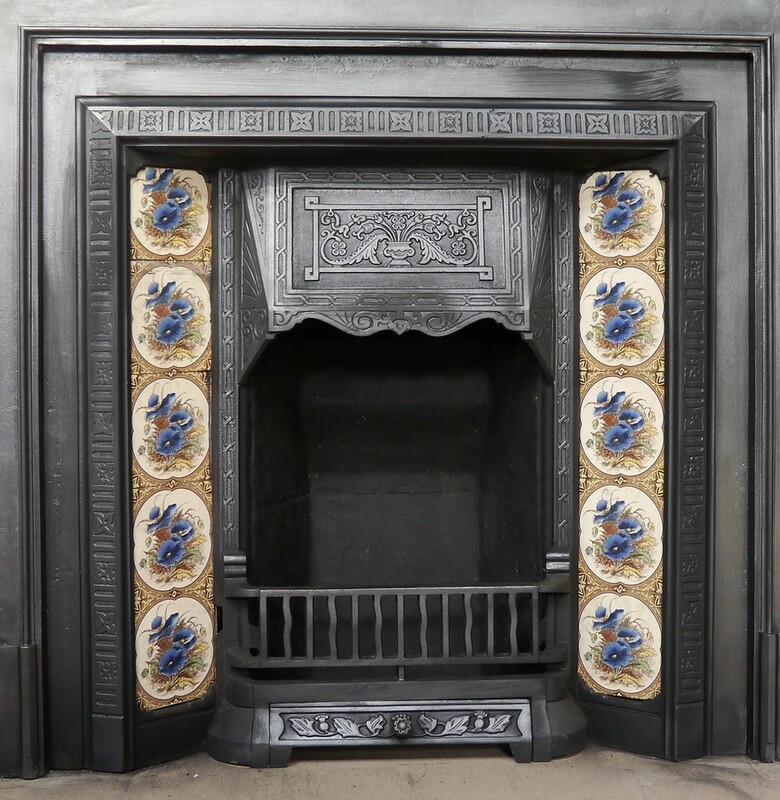 BSTI-003 Cast iron tiled insert fully restored and ready to go as a working fireplace. Pictured with a set of original fireplace tiles, sold separately. The tiles can be changed with others from our collection, we have over 150 sets of reclaimed fireplace tiles to choose from. This fireplace can also be supplied without tiles should you wish to provide your own. 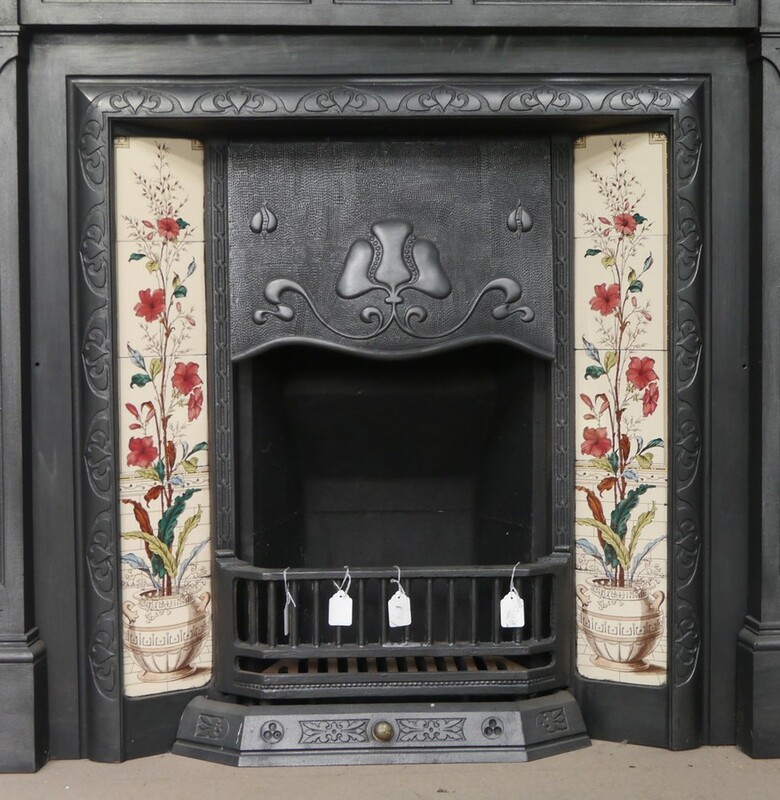 BSTI-004 Cast iron tiled insert fully restored and ready to go as a working fireplace. Pictured with a set of reproduction fireplace tiles, sold separately. The tiles can be changed with others from our collection, we have over 150 sets of reclaimed fireplace tiles to choose from. 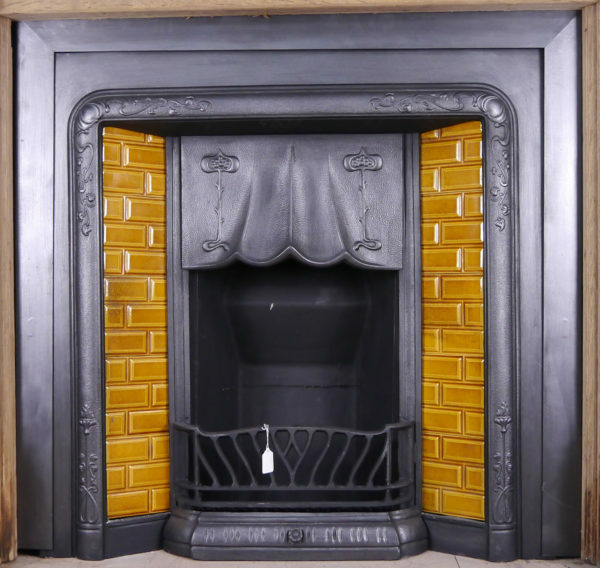 This fireplace can also be supplied without tiles should you wish to provide your own. .
BSTI-006 Cast iron tiled insert fully restored and ready to go as a working fireplace. Pictured with a set of original fireplace tiles, sold separately. The tiles can be changed with others from our collection, we have over 150 sets of reclaimed fireplace tiles to choose from. This fireplace can also be supplied without tiles should you wish to provide your own. 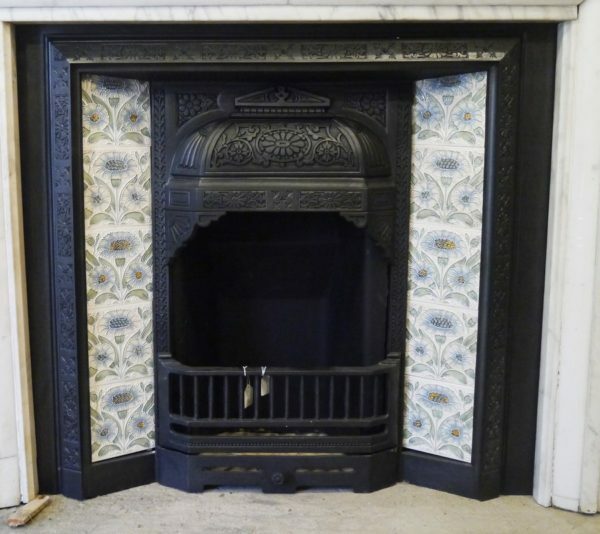 BSTI-007 Cast iron tiled insert fully restored and ready to go as a working fireplace. Pictured with a set of original fireplace tiles, sold separately. The tiles can be changed with others from our collection, we have over 150 sets of reclaimed fireplace tiles to choose from. This fireplace can also be supplied without tiles should you wish to provide your own. 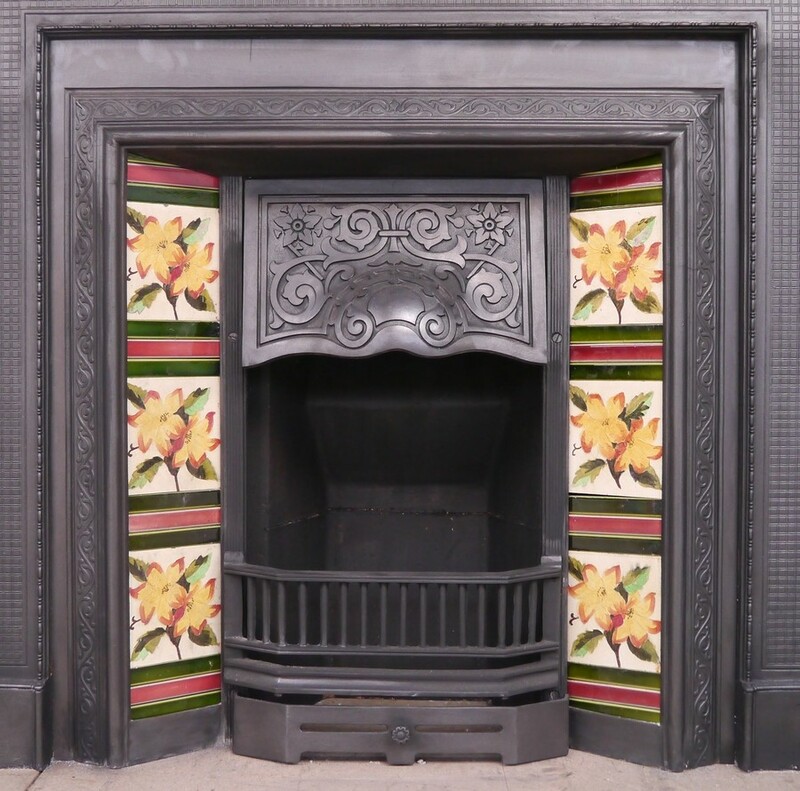 BSTI-009 Cast iron tiled insert fully restored and ready to go as a working fireplace. Pictured with a set of original fireplace tiles, sold separately. The tiles can be changed with others from our collection, we have over 150 sets of reclaimed fireplace tiles to choose from. This fireplace can also be supplied without tiles should you wish to provide your own. 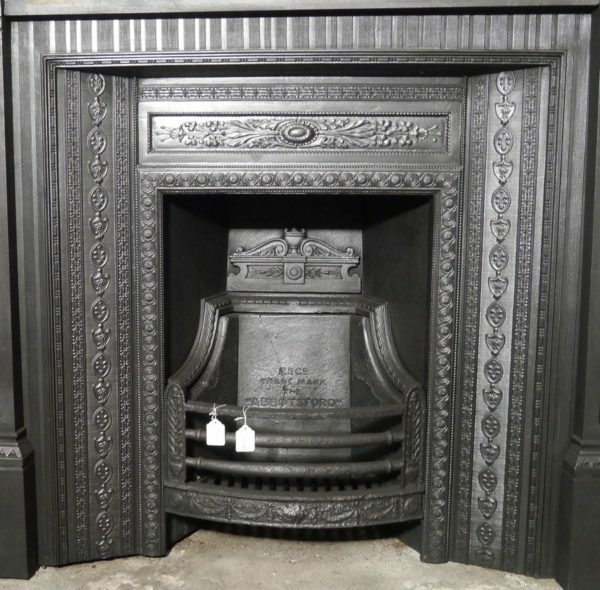 BSTI-010 Cast iron tiled insert fully restored and ready to go as a working fireplace. Pictured with a set of original fireplace tiles, sold separately. The tiles can be changed with others from our collection, we have over 150 sets of reclaimed fireplace tiles to choose from. This fireplace can also be supplied without tiles should you wish to provide your own. 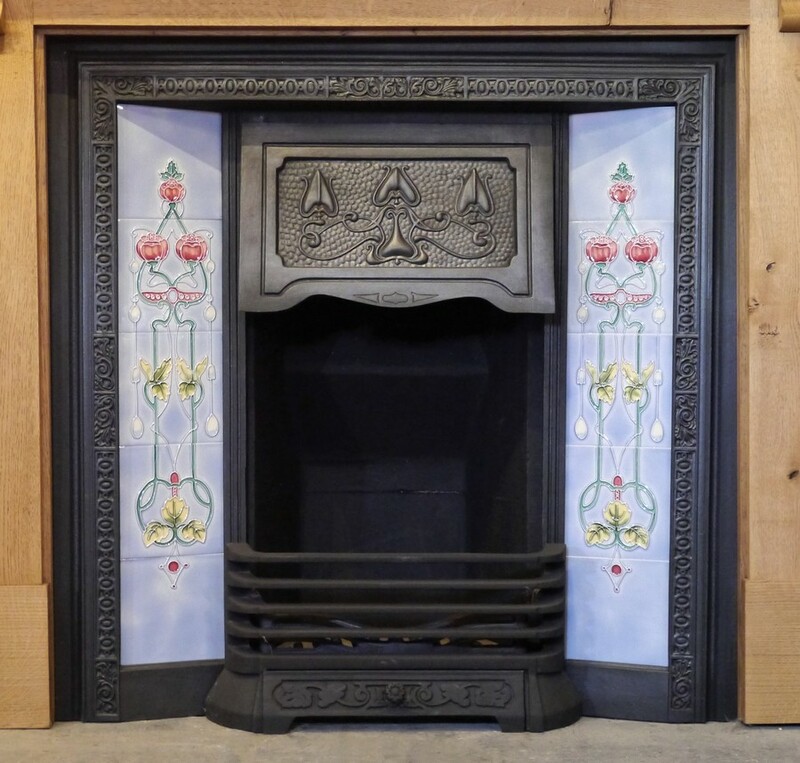 BSTI-011 Cast iron tiled insert fully restored and ready to go as a working fireplace. Pictured with a set of original fireplace tiles, sold separately. The tiles can be changed with others from our collection, we have over 150 sets of reclaimed fireplace tiles to choose from. This fireplace can also be supplied without tiles should you wish to provide your own. LSTI-005 Reproduction Art Nouveau style cast iron tiled insert. Tiles can be changed from a choice of our stock tiles.